Between revenue from oil exports and foreign aid, over $100 billion has been pledged to Iraq's "relief and reconstruction" in the last four years. Yet there is precious little to show for it. About half of this amount is Iraq's own money. The United States has allocated a total of $38.28 billion in aid as of the end of 2006, but only $12 billion has been spent on civilian reconstruction with most it going to the Iraqi army and police. Other donors have pledged just over $15 billion, but most of this has not been delivered because of the chaos and violence in the country. The amount of money spent on reconstruction is not at all trifling. It is equal or greater than the money in inflation-adjusted dollars spent by the United States on restoring post-Nazi Europe under the Marshall Plan. There are, of course, clear differences between the Iraqi and German experience, as there was less violence and the Europeans were allowed to plan their own reconstruction. The grant money was spent on local companies, not U.S. companies. Most of the money went to fertilizer, food, fuel, raw materials, and semi-manufactured products, not for gigantic building projects. These different priorities may well be a key explanation for why the Marshall plan was successful and Iraq is a failure. Much of the failure may also be easily explained by the deteriorating security conditions and the political mess. But there is definitely a third factor—the corruption, incompetence, and waste. To date, over $387 billion of U.S. taxpayer money that has been spent on the war in Iraq alone to date—roughly $13,750 per Iraqi in the country. Yet the money has gone mostly to the U.S. soldiers and armaments. If we divide the money by the number of U.S. troops stationed in the country, it adds up to well over $2 million per soldier over the duration of the war so far. Contrast this figure with the $12 billion of U.S. taxpayer money spent on civilian reconstruction, and add in the money spent by the Iraqi government on similar projects: the per capita expenditure per Iraqi citizen works out at a mere $1,000 or $250 a year plus a similar amount to equip and train the Iraqi security forces. Even if you add the entire Iraqi government budget to the amount spent in foreign aid, it adds up to less that $4,000 per citizen or $1,000 per year. Or, to put the priorities of the U.S. government a different way, just $3.33 out of every $100 in U.S. taxpayer dollars spent in Iraq has gone to Iraqi civilian reconstruction (not counting the cost of the security forces). Various estimates put the cost of private security at about a quarter of this expenditure, so the number is reduced to $2.50 on civilian reconstruction per $100 spent in Iraq. Factor in that U.S. companies that paid overhead and salaries for U.S. workers built many of these projects and the actual amount spent in Iraq dwindles to less than two dollars per $100 of expenditures. The contrast between how the average Iraqi lives and the soldiers who patrol their city streets in Star Wars like-technology of Humvees and Black Hawk helicopters speaks louder than any pie chart. According to the Brookings' Iraq Index, some indicators have improved for Iraqis, such as an increased number of children enrolled in primary schools, more cars and cell phones and Internet subscribers, and a much wider variety of media such as TV stations and newspapers. But the quality of life indicators in general offer stark evidence of the failures of the reconstruction. Water treatment capacity went down from three million cubic meters a day before the invasion to 1.3 million cubic meters a day in March 2006 (the latest available figures), while only 9.7 million people had access to this water compared to 12.9 million before the war. The number of people with proper sewage has dropped from 6.2 million to 5.6 million. Adding to the hardship of ordinary Iraqis, government rations introduced in 1996 under the United Nations' oil-for-food program have been severely cut back. Essential staples like rice, sugar, flour, and cooking oil are still distributed to the population (without which there would be widespread starvation), but many other basic goods like salt, soap, and beans have been axed from the program. (1) Meanwhile the cost of goods on the open market has shot up, because of International Monetary Fund-mandated increases in fuel prices. Inflation in 2006 hit 70 percent, double the rate in 2003 and over three times the 2005 rate, largely because of the fuel price increases. Why did the Coalition Provisional Authority (C.P.A.) and the subsequent Iraqi governments do such a bad job of fixing Iraq? There was next to no planning; there was a major shortage of qualified personnel; those that did volunteer were inexperienced; few stayed for very long; and the constant turnover of staff created chaos. "There seemed to be too many chiefs in the palace, multiple people who had been summoned to the White House and told that they had been personally selected to run a part of Iraq, only to arrive and find that someone else had been told the exact same thing," Rory Stewart, the C.P.A. official in charge of Maysan, would write later. (2) "Then there were the non-Americans, who had been appointed by their politicians to do the very same jobs. Much of the energy of the C.P.A. went into trying to establish office space, size of personal protection detail, access to cars and helicopters, reporting lines and access to Bremer." Then there was the complete lack of preparation. In Paul Bremer's autobiographical book about his year in Iraq, he expresses surprise at the state of collapse of the Iraqi society ("Nobody had given me a sense of how utterly broken this country was") and then goes on to explain how he tried to create a political leadership to take charge of the country. He dismisses the U.N. as excessively bureaucratic and ridicules the socialist system of rations, subsidies, and employment in the country (almost one in ten Iraqis had government jobs). Yet had he read any of the U.N. reports that he so disparagingly dismissed, he would have known that the country was in a state of collapse, and the only thing holding it together was the system of rations, subsidies, and employment in the country created under the much criticized oil-for-food program. By refusing to put the army and police back together, and approving the de-Baathification of Iraqi society and downsizing the ministries, Bremer caused the fragile society to break apart. Without jobs, the people grew poor and restless. Without fixing the electricity and health system that people depended upon, he created anger. Finally by manipulating the politics of the country, he disenfranchised and empowered some of the very people who would later become the leaders of the insurgency. Modern Iraq is an intrinsically unsustainable society, like many other Middle Eastern nations, because it was built around the plentiful supply of petrodollars. It stayed together during the sanctions, although this supply of money had been cut off, because it was controlled by a dictator who brooked no opposition to his policies and because the oil-for-food program supplied the basic necessities of life. The excuse that C.P.A. officials used as they struggled to put the country back together was pat: it was all Saddam Hussein's fault. The Ministry of Health repeatedly told me that the former regime spent just 16 cents per citizen on health per year, and Bechtel informed me that the dictator had failed to fix the sewage treatment plants. While these statements had a measure of truth in them, they were by no means the complete picture. The U.S.-led bombing in the 1991 Gulf War had destroyed much of the infrastructure, and the sanctions delayed or limited much of the medical supplies requested by Iraq, which was dependent on imports for much of its needs. Yet the lack of knowledge of history was hardly the only problem. "I saw enormous incompetence, which was more costly than even Iraqi corruption," Richard Garfield, an expert of the Iraqi healthcare system, would say later. A year and a half after the invasion, Larry Crandall diagnosed the same problems. Crandall is a retired USAID official who accompanied the army on the 2003 invasion and later became the second highest-ranking officer in the reconstruction program in 2004. 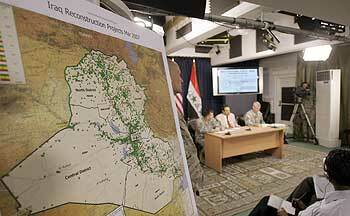 He explained that the U.S. officials had not consulted with the Iraqis on the reconstruction. "You hardly ever hear members of the Iraqi government talk about it, be it in terms of their support for it, their concern about it, their participation in it, and it's simply because they don't understand it very well. It's basically implemented through American contractors who have little, if any, contact with significant members of the Allawi administration out there or the previous interim government administration. So it is like an island unto itself, if you will." For the C.P.A. officials, all that mattered was numbers. "Achievements were tallied like body counts: another 100 schools painted, another clinic opened, another 1,000 Iraqis employed—statistics that said little about the reality on the ground. It was rebuilding without a foreman or blueprints," wrote T. Christian Miller later, who sarcastically described the C.P.A. 's nation-building process as "crafted with the care of a sand castle. "(3) Even at its height, the reconstruction program employed 140,000 people in the country, or about half-a-percent of the population. One of the key issues is what Miller calls the "pipes" problem. Put simply, a brand new water purification plant is useless if there are no pipes to deliver the water to the community or worse yet, if they are rusty. Yet the C.P.A. 's grand projects were just that—gigantic high-tech schemes to deliver electricity, health, and water, and nobody had even bothered to work out if they actually needed to be connected to the community. They supplied gas turbines without fixing the gas supply. They built electricity substations in Basra but not power distribution lines. They bought expensive health clinic equipment that sits in a warehouse while hospitals have to beg for simple supplies like disinfectant. These schemes were built by reputable international companies who did what they could and left when it became too violent and even their expensive private security could not prevent attacks. Indeed the international companies often attracted attacks, as they were easily identified by their hardhats and goggles or because they were accompanied by gun-toting guards. Today the Army Corps has learned its lessons and stopped hiring international companies. It now realizes that local companies are less likely to be attacked, cost far less, and are perfectly capable of doing a good job if properly supervised. For all the outcry about corruption and war profiteering, the problems in Iraq really boil down to ignorance, incompetence, and waste. The level of fraud in Iraq contracting is far less significant. Yet the public and policymakers are easily confused. At a recent Congressional hearing, Democratic lawmakers repeatedly mixed up these basic concepts. A dozen politicians denounced the missing $8.8 billion of Iraq's oil money without fully comprehending that the money was spent on Iraqi government salaries and that only the receipts were missing. (4) It's entirely possible that 99 percent of the money was stolen, but it is also entirely likely that just a few dollars were misappropriated. The reality lies somewhere in between and the solution is to have a proper tracking system. Even the $2.4 billion of "unsupported" and "questioned" costs that Rep. Henry Waxman (D-Calif.) wants Halliburton to account for in Iraq does not represent $2.4 billion in lost or stolen money. (5) The "unsupported" costs represent charges without receipts (a total of $450 million) that may well have been legitimately spent. The "questioned" $1.9 billion represent costs that are unreasonably high, but if Halliburton could provide answers and receipts, the numbers might conceivably drop considerably. The actual waste may lie anywhere between zero dollars and $2.4 billion. And a simple answer to this problem would be to refuse to pay for anything without a receipt and proper justification. Unfortunately for the military, there are simply not enough supervisors to make sure that a company does not waste money. Nor does the military have any leverage over the companies. The day that Halliburton stops working, the military would cease to function. This situation, where the contractor has more power than the government, is unequal and rife with potential for abuse. Much has also been made of "no-bid" contracts in Iraq. But once again the reality is more complex. A General Accounting Office report shows that almost all military and USAID contracts were competitively bid. The main agency guilty of no-bid contracts is the U.S. Department of State, which has relatively fewer dollars to spend. (6) Even the much criticized Restore Iraq Oil contract, which Halliburton was awarded without bidding, was in fact legal. (7) Just because the contract was legal, however, does not make it morally justifiable, nor does it mean that the government hired the best contractor. Also, the people in charge of managing the contracting were contractors themselves. A virtual pyramid of contractors exists, making accountability impossible. When anything goes wrong, everybody pointed their fingers at each other. The original idea of using private contractors to do reconstruction was that they would be more efficient, but that seems extremely unlikely. All this subcontracting perhaps suggests excessive staff, but that's not true. Only 24 people were in charge of issuing the billions of dollars worth of contracts, and that was far too few. In the military, the same sum of money would be overseen by hundreds, if not thousands, of contract staff. But there was no clear chain of command and no rules to follow. Too few people, with no rules, make a bigger mess than a few people following well thought-out plans and rules. While thousands of projects "completed" have later been discovered to be failures, some have succeeded. The repair of Umm Qasr ports, a massive dredging job completed by Stevedoring Services of America, appears to be one. The vaccination of millions of Iraqi children is another. Terry Callahan is a colonel in the U.S. Army Reserves who spent a year in Iraq following the invasion, where he was in charge of distributing C.E.R.P. money in northern Iraq, as the C.P.A. chief of staff. He explained that the accountability over Iraqi money was loose, compared to appropriated money that came later. He says that the program had many small successes—like a three room kindergarten school for $4,000 and a community center for $250,000. "We had more money than we could throw at the problem, which then breeds corruption," he told an interviewer from the U.S. Institute for Peace. "The funds were there in more than adequate amounts because we had a problem with absorption. If someone says, in a small region the size of one-third of Iraq, you have $20 million to spend on projects and you have 30 days to define where those projects are, you can't do this properly. For example, we had trouble in some cases finding enough contractors to do the work in the timeframe allotted." Some of the well-intentioned military projects were not welcome. "For example, we had a project in Baghdad called Operation Neighborhood Clean-Up or some such thing," Crandall related. "We had Civil Affairs guys and M.P. 's (military police) and others out cleaning the garbage in towns, and in some of the suburbs and small neighborhoods in Baghdad. As our front loaders were loading up the garbage and suddenly a few people started getting really irritated. We asked, 'Why are you so angry, we're cleaning up your garbage?' Well, as it turns out, the garbage fed the goats, and the goats provided meat." First, it should fix Iraq's electricity, water, sewage, health, and oil infrastructure—with local small-scale familiar technology not big high-tech modern equipment that no one knows how to use. Make that the first goal for withdrawal. Shias, Sunnis, Kurds all agree on this. Congress should put its money where its mouth is. Write a check for $100 billion. That's the minimum that Iraq needs and that's what we spend on the war every year. Iraqi companies should do the work. When companies like Contrack pulled out of fixing the Baghdad Central Railway Station, Iraqi companies finished the job, cheaply and well. Every Western contractor used Iraqi labor. Pay the workers in the country directly, not the C.E.O. 's abroad. Protect Iraq's infrastructure. Ignore the people who say you shouldn't have guarded Iraq's oil ministry. The question: is why haven't you protected the oil pipelines or the water plants, the sewage plants, and the power lines? Fix the "pipes" problem. Connect the new power, water, and sewage plants with the people. Ditto with power plants. Iraq was given new combustion turbines but is running them off crude oil. Make sure that natural gas is used in a natural gas plant not dirty crude oil. Fix that last mile between the gas fields and the turbines. Fix the oil meters so that Iraq's oil exports don't get stolen—this is ludicrous for a country whose entire economy depends on one resource. Halliburton hasn't done this simple job, so find someone who can. Provide Iraq with as many basic medicines and medical supplies as it needs. Free. Iraqis don't need high-technology hospitals like the one Bechtel was building for Laura Bush in Basra. But they do need disinfectant and back up power generators. Make the companies that took obscene profits for bad work--like Bechtel and Parsons who walked away from unfinished hospitals and schools--pay to fix them. Ultimately there should be a system of transparency and accountability for all actors, with strict enforcement of penalties. Pratap Chatterjee is the Managing Editor/Program Director at CorpWatch and the author of Iraq Inc.: A Profitable Occupation. This essay is excerpted from his upcoming book, Baghdad Bonanza: Iraq's Failed Reconstruction. 1. Daud Salman, "Cut in Food Rations Hurting Poor Iraqis," Environmental News Service, April 3, 2006. 2. Rory Stewart, The Prince of the Marshes (New York: Harcourt, 2006). 3. T. Christian Miller, Blood Money (Little, Brown, Aug. 2006). 4. "Oversight of Funds Provided to Iraqi Ministries through the National Budget Process," Special Inspector General for Iraq Reconstruction, Report # 05-004, Jan. 30, 2005. 5. Memorandum from Congressman Henry Waxman to U.S. House of Representatives, Government Reform Committee, Feb. 15, 2007. 6. "Rebuilding Iraq: Status of Competition for Iraq Reconstruction Contracts," General Accounting Office Report # 07-40: Oct. 2006. 7. "Attestation Engagement Concerning the Award of Non-Competitive Contract DACA63-03-D-0005 to Kellogg, Brown, and Root Services, Inc.," Special Inspector General for Iraq Reconstruction, Report # 05-019 Sept. 30, 2005. 8. Steven Weisman, "U.S. Is Quietly Spending $2.5 Billion From Iraqi Oil Revenues to Pay for Iraqi Projects," New York Times, June 21, 2004.